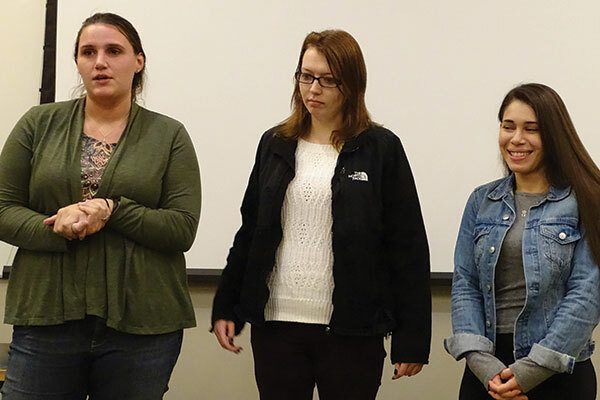 College of Saint Elizabeth students, from left, Morgan Sim, Dana Fuardo, and Mia Shevere, describe their visit to concentration camps and Holocaust memorial sites on a trip sponsored by the school’s Center for Holocaust and Genocide Education. Six months after touring concentration camps and Holocaust memorials in Germany and Poland, a group of 10 Catholic students and their teachers relived the experience Nov. 9 at the College of Saint Elizabeth in Convent Station. 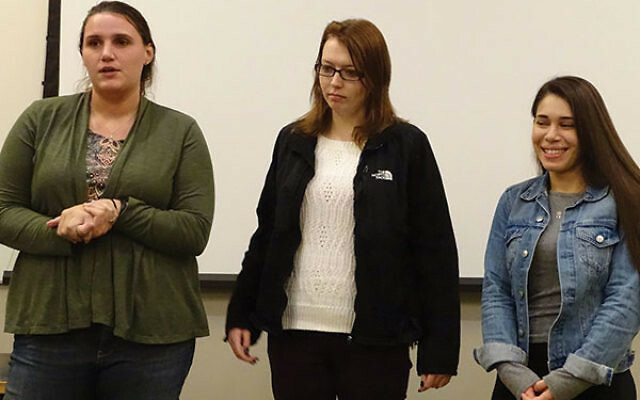 The occasion was the screening, in the college’s Annunciation Center, of a 58-minute documentary of their visit called Rest Here: Universal Lessons of the Holocaust, by Summit filmmaker Lisa Reznik. The pilgrimage began in Berlin on May 15 and ended six days later in Warsaw. Helping them understand the horrors that happened in the places they visited — Auschwitz, Majdanek, and Treblinka, the ghettos of Warsaw and Cracow — was a guide named Pinchas Gutter. Born in 1932, he survived life in the terrorized Jewish enclaves in Lodz, then Warsaw, before he and his family were incarcerated in Majdanek. Gutter, who now lives in Toronto, brought his wife, Dorothy; his daughter, Rumi; and his 27-year-old grandson, Daniel, on the trip. Together they retraced his steps through the hellish years of World War II and shared his memories and their reflections with the students. At one point he led the group of 33 into the barracks where he had been confined as an 11-year-old boy. In the film, standing in front of the bunks where he slept, Gutter told the group that he was kicked repeatedly and brutally by a kapo — one of the prisoners the Nazis had tasked with disciplining fellow inmates. Gutter said he still suffers the aftermath of that assault. Since his first return to the camp in 2002, he has been especially interested in giving guided tours to non-Jews. Contrary to expectations, the attendees said the mood of the trip was not altogether morose. Three of the undergraduates who went on the trip addressed the audience after the screening, at the college’s Annunciation Center. The students were asked how they related as non-Jews to the events of the Holocaust and whether the might have risked their own lives to save Jews from persecution. Reznik said she hopes to receive grant money to complete the editing process on the film and have it shown at film festivals and on public television. She would also like to see it used as an educational tool. Like the students, it was her first visit to the camps and ghettos. “It showed me the importance of making sure that genocide never happens again,” she said. The event was part of CSE’s 26th Annual Kristallnacht Commemoration-Week of Holocaust Remembrance.